Wipe on, walk away paint sealant! 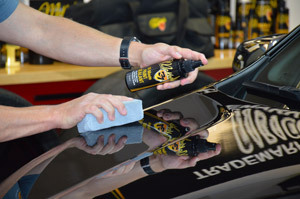 McKee's 37 10 Minute Paint Sealant is an SiO2 enhanced, wipe-on, walk-away product that leaves a long lasting high gloss finish after just one application. Safe for use on all exterior surfaces, including paint, wheels, chrome, and even glass, McKee's 37 10 Minute Paint Sealant's hyper-concentrated formula is easy to use and will provide up to 6 months of protection! If you're short on time but don't want to sacrifice your car's finish, McKee's 37 10 Minute Paint Sealant is just what you need! What's the most important aspect of detailing? Protection, protection, protection! In fact, that's how the whole concept was born! Back in the beginning, waxing your vehicle not only kept your paint shiny, it also protected your car from harmful UV rays and only took a couple hours out of your day. But the detailing world has evolved and with it comes a new generation of protection – sealants, coatings, etc. – none of which take a short amount of time to apply. McKee's 37 10 Minute Paint Sealant can be used on any hard exterior surfaces - including paint, glass, wheels, and chrome! But not anymore! McKee's 37 10 Minute Paint Sealant is the next (and quickest!) way to protect all exterior surfaces on your vehicle. 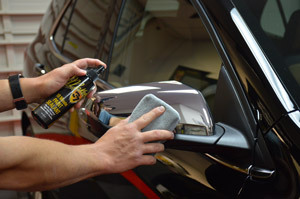 As the name implies, after a quick 10 minute application, your paint, glass, wheels, and chrome will be protected up to 6 months! McKee's 37 10 Minute Paint Sealant is extremely easy to – literally, wipe on, and walk away – and creates an enviable high gloss finish. If you find yourself with a spare 15 minutes on a Saturday morning, or on your lunch break at work, you now have the time to apply McKee's 37 10 Minute Paint Sealant! Working ONE panel at a time (Hood = 2 Panels), spray ONE mist of sealant directly onto the surface. Evenly distribute the sealant using a microfiber applicator pad. Maintain the gloss and protection using McKee's 37 Sio2 Auto Wash and Trademark Extender Spray Wax. Excess sealant is easily removed using a clean microfiber towel. I have only used the 10 minute paint sealant on my wifeâ€™s black explore but after 1 month on her daily driver that never sees a garage it seems to be works well. Vehicle cleans back up well using the sio2 car wash. It goes on really fast and would be excellent on a brand new vehicle. Very easy to apply to the paint. Applied using some microfiber applicators. One spray to prime the pad, and 1-2 sprays for each section after that. Goes on easily, disappears into the paint unless it's used very heavily. I still buffed it off after applying, despite it being a wipe on walk away style product. I used this to top a car coated with McKees Paint Coating (Sio2 enhanced) and it improved the beading of my 9 month old coating and made it much more slick and glossier. I also applied it to my rims, which are protected with Hydro Blue, and it made them noticeably glossier and very slick as well. Applied it to half of the windows so I could compare it to Rain-X, and while it's slightly less hydrophobic than Rain-X it's much easier to apply. Also applied to plastic trim, both rough and smooth, both coated and uncoated, and it makes these surfaces bead very well, but the beading is worse on very rough plastic (to be expected). Overall, I would recommend this product. Beading on previously unprotected paint is better than Meguiar's Ultimate Fast Finish, which was my previous go to for this style of sealant, but this is much better because it can be applied to basically every surface without any issue, unlike Ultimate Fast Finish.